I bought this buffalo tartan plaid a while back from Fabric Depot and finally found a project for it. I'm sewing up one of the Built By Wendy Simplicity patterns, 3835. I'm mashing up characteristics of both dresses into one. I'm making view A, which is longer, and adding the longer sleeves of view B, but not adding the ties. 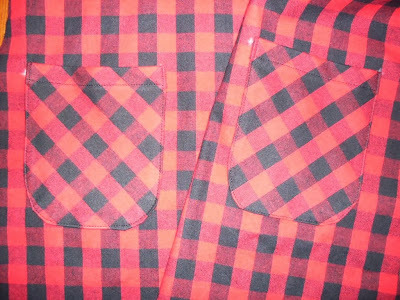 Here are the patch pockets that I cut on the bias and sewed on the other night. I used Casey's clever tip of tracing a pocket template out of cardstock and then ironing the edges of the pocket up around that. It worked like a charm!